Hi everyone! It's time to talk about the tech side of our move to . With over 11 years of posts and 100,000 comments, it was definitely more involved than simply starting a blog for the first time or moving a blog with only a few years of content over... Yet, it was surprisingly very straight forward and the results exceeded our expectations. To continue in the conversation about this move from my previous two posts (here and here), today we're going to get into the nitty gritty behind the move from a more technical standpoint. I've asked my husband, Thorsten Becker, who has a background in the tech industry, to tell you more about how the move panned out because he's the one who worked on this for me. Hopefully you will walk away with some knowledge that you may be able to apply to your own blog and if you decide to do so, please consider because they’ve definitely earned my respect. Back in 2003, I was looking for an easier way to maintain a content-focused site with frequent updates. Up until then I had written everything on my own site in HTML, which was quite laborious – write the content, paste into the HTML code, code check, upload, verify, fix any mess-ups. I eventually talked about content management system with a local entrepreneur who was starting his own hosting business. We were both trying out a few, Drupal and WordPress amongst them. We agreed that WordPress seemed to be the most promising. Shortly thereafter, I signed up for a small hosting package with him and installed WordPress for the first time. It was a revelation. Writing and publishing online had become a lot more enjoyable for me. I also started posting more regularly as I didn’t have to deal with tedious coding tasks anymore. In January 2006, Holly started blogging, creating what has since become one of the most influential design blogs worldwide. I had shown her a few things I was doing on my Wordpress site and how easy it was to publish content for a global audience (up until then she had mostly posted on design forums, which are generally closed environments, and had her own Yahoo Groups page). However, since she already had a Blogger account which she'd created in 2005, she used that to get cattledogs started. Blogger.com was fun for Holly to use at first (she still uses it to write her expat blog, ), but over time it became somewhat limiting. Customizing the site was difficult because it often required coding, and new features simply couldn’t be added. If we wanted a custom template we had to get it properly coded. If we wanted to customize it ourselves afterwards, we had to write code. Also, extending functionality wasn’t possible at all and the options that Blogger offered back then were rather few and limited. So, while writing on it was fun, the rest really wasn’t. In July of 2008, Holly and I decided to move cattledogs to WordPress, which we hosted ourselves. I took on the administrative tasks of maintaining the server and the Wordpress back end. Initially, Holly was quite happy with the decision and all the new possibilities available -- easily extending functionality with plugins was great. Installing new templates was a breeze, just upload, activate and tweak a bit. Done. Everything seemed to be better than before. Maintenance began to increase dramatically. Traffic on the site grew rapidly and we started running into server resource issues which led to cattledogs not being available for stretches of time. We upgraded the package several times until we eventually took on a VPS, a Virtual Private Server. That, however, led to an increased workload on my side. I now had to manage the server infrastructure myself, including security-related tasks. Also, with each update WordPress became more and more resource hungry. I constantly needed to optimize server settings to keep the site running smoothly while also fending off several large-scale attacks directed at it. This is where WordPress turned troublesome. While we had a lot of flexibility – at one point using close to 40 different plugins, it came at the cost of constant monitoring, tweaking, hardening, etc. We also needed to replace plugins frequently as developers decided to no longer update them. WordPress’ open source environment with its myriad of plugins and templates and modifications, which once looked so attractive, caused a lot of headaches. In addition, many of the commercial plugins we once bought started employing year-over-year paid update and support schemes, increasing site expenses. Redesigns, of which we did a few, never went without a hitch. At one point, I had to create a separate staging site to ensure the next redesign didn’t take the site offline. Some WordPress templates even had gaping security holes that could be exploited by hackers – unbeknownst to us. After some consideration and deliberation, I set out trying to find a better blogging solution, one that didn’t require maintaining a server. The only real alternative, at least for us, turned out to be . Holly already had an account which I used to put the interface through some tests. I instantly found it to be very intuitive, easy to use and most of all fun to write on. Pages and posts can be composed in a similar fashion to using DTP software – add a text block, add image blocks, add text and image blocks, mix and match, expand, decrease, remove. It simply made sense and felt familiar. I tried some sample imports, bringing a few cattledogs posts and comments in to a test site on . That, too, worked flawlessly. However, to bring a large site like ours over, some planning was needed. Over 6,000 posts and over 100,000 comments had to be transferred. Unfortunately, we couldn’t do it in one go. Again, WordPress got in the way. A full export of all data kept timing out. Our server team tried to assist by increasing all timeouts values in the server environment – to no avail. I decided to do partial exports instead. That initially didn’t work either. There is a long-standing bug in WordPress that excludes featured images from posts if a partial export is done. To rectify this a plugin is needed. That plugin led to timeouts again. I was going around in circles. Eventually I created one, large partial export for all posts from 2006 to 2014, knowing that featured images would be missing (though we hadn’t started using them until about 2013). For 2015 to 2017, I then created monthly exports with featured images. In some cases, I had to break it down even further, creating two or three export files for a single month. Once done, the files imported flawlessly into . It was worth the effort. Holly is a prolific writer. She can turn out a book in a week if she wants to. But after moving from Blogger to Wordpress I noticed that she was writing less and less on cattledogs. By 2010 she was posting about half of what she used to on Blogger. While she was rather busy with new projects, including her books and , the real reason might surprise you - Wordpress' interface. While I had really liked using Wordpress and had convinced Holly to switch, her experience was quite different from mine. She was simply not having fun using Wordpress, silently struggling with it for 7 years, finding it to be quite confusing and even stressful. She had voiced her frustration on several occasions but no matter what we tried, it just wouldn't make it enjoyable. However, as soon as I had tried Squarespace I was certain she would really enjoy using it. Everyone's different but in general I find Wordpress geared more towards technical minded users. Squarespace on the other hand is clearly aimed at design oriented users such as Holly. As soon as the move was done and Holly was writing her first post she had a big smile beaming across her face. She explained that she loved writing again because it's so easy and intuitive to put together a post on Squarespace. Adding photos and creating various layouts is fun for her now. Within a few days she's learned the entire interface and has no issues navigating it. Not even a week later she is posting regularly once more and she can't wait to get her next post up. She’s excited again to blog and is going full speed ahead. Almost 12 years of cattledogs content is with now and we are very pleased. Moreover, blogging is fun again for Holly. She really enjoys the interface and the options available to compose her posts – and any auxiliary content as well. I once was an eager proponent of WordPress, advocating it and recommending it to almost everyone interested in blogging due to its flexibility and extensibility. This, however, turned to be its biggest downside for us. It just wasn’t working for cattledogs anymore. With Squarespace, we have found a platform that works and that's made blogging fun again. Want to make the switch the which offers ? Sign up for a 14-day free trial. When you're ready to subscribe be sure to use code 'DECOR8' for 10% off your first purchase. This is a sponsored post in partnership with Squarespace. All words and opinions are our own. Thank you for supporting the brands that help keep cattledogs blogging for over 11 years. Welcome To The New cattledogs! Hi everybody! We've moved cattledogs and 11 years of content with over 100,000 reader comments from Wordpress to and today we will continue the conversation from this post to talk more about the tech side of how using Squarespace will make my work/life a lot easier now. But before getting into the tech stuff in the next post, which is very important for you to hear because it's a big part of running your own business if you have a blog tied to it, I want to first introduce you to the all new cattledogs and tell you about a few things that make me VERY excited. Two pages were added: MY BOOKS and SHOP. MY BOOKS is just that, all of the books I've written with image galleries and a few have videos. Later, I will detail on that page the exact language and the book title name in that language, so you can google it and find it (hopefully) in your country. The book page will later contain the names of all of the books I've also contributed to that included my home or office, or something else from me like a quote, design advice, etc. But for now, the MY BOOKS page is finished and I love it. SHOP is a brand new adventure for me! Since removing ads from the site, I thought about other ways to earn income to make up for the loss while also feeling good about my business. The truth is, I didn't enjoy managing an ad business or having ads on my site. It's a personal decision and I'm glad I made it for me and my business. I expanded in other ways to make up for the financial loss and my business still continues to grow consistently year after year since launching it in 2006, so I can't complain. The SHOP is a way for me to earn a living but by doing more of what I love, and that is consulting with those who need me as a mentor. This way, I can connect very personally with those of you who really need help with your business, work/life balance, sorting ideas, branding/marketing, or how to ramp up a blog or social sites. I have over 11 years of full-time experience in this industry so I have a lot of value to give and can save you a lot of money, many tears and stress because my tips and guidance provide the ultimate shortcut to success. Later, I will add physical products to the shop and other goodies (I can't wait to tell you more later). Over the next few months, I'll break those categories into sub categories (like DIY, HOME TOURS), but for now, that's what we have as our core to keep things very focused and simple. a lightbox for in-post photos! Also with this new blog came a NEWSLETTER! For the first time ever, I have a newsletter that I write personally and send to my subscribers each Friday. The first one was released on August 4th, the day the new site went live. Going forward, if you subscribe to the newsletter, you will get one each Friday (no other day, we won't annoy you!). The cattledogs newsletter will always contain a personal letter from me, my favorite links and things from the blog and elsewhere, any shop or book updates, special content I won't put on my blog or share publicly, and sometimes you'll get subscriber-only contests and special discount codes to my favorite online shops. You can subscribe to the newsletter . We hope you love the layout and design and please comment if you have any questions or notice any errors or dead links/pages... Or typos! I would love the help if you spot errors, the more eyes the better. So! That's a little bit about the new cattledogs. We hope that you like it! In the next post, which we'll publish tomorrow, we'll detail the tech side of move to Squarespace and how it has already impacted our business in only a few days time. I was utterly amazed when I read about this beautiful restaurant in the 16th arrondissement in Paris recently because I fell so deep in love with the decor! You have to check this place out, it's called , and it's definitely on my list for the next time I'm in Paris. I find the color scheme really rela, don't you? I like the geometric patterns on the upholstery as it complements the pattern on the minty wooden walls. The pendant lighting is equally stunning, I have one of these Dutch-designed lights in my dining room but liked seeing multiples in a room. Of course, the addition of climbing roses, jasmine, olive trees (on the terrace) and banana leaf plants (interior) are perfect. Not too much, but enough to add warmth and natural beauty. I'm so happy I discovered this spot in . Now I'm thinking that maybe I need to get back on the train and go to Paris again... Last time I was there was in March, and as the saying goes, "Paris is always a good idea". This is one of the luxuries of living in Europe, to have access to all of these beautiful cities so easily and affordably. Hello friends, happy Friday! I realized that I'd forgotten to tell you about my long weekend in Barcelona a few weeks ago, so today I simply must share some photos and my impressions, both good and bad, and then end my review with a bullet list in case you have plans to see Barcelona in the near future and need a few tips. First, from an architectural perspective, there are many beautiful buildings to see from the residential districts to the old town, and of course, the , which will leave architecture and design lovers speechless. We saw the Sagrada Família, Casa Batlló, Casa Milà and part of Park Güell but there are many more. Next, the beach is beautiful BUT it was also gritty with lots of trash, and dozens of men bothering you nonstop to buy cocktails, cotton blankets, beer and water. They literally swarm your blanket every 5 minutes for the entire time you are sitting there. I felt exhausted by this. It was just too much. The same took place at Gaudí's - the "free" part of the park at least. Men selling things on blankets everywhere. You go to a park to be with your thoughts and with nature, not beat off peddlers. We didn't get into the side where you could see the works of Gaudi because you must book tickets online in advance during busy months and no one told us this. I wish our hotel had briefed us that these tourist attractions required tickets purchased in advance online. I was mega disappointed because as a fan of work, after seeing her inspiration from Gaudí in her Grotto in Hannover, I had to see the Gaudi park in Barcelona. Then the was also a spot where we got turned away. That building is just insanely gorgeous on the outside, I was dying and nearly in tears that I could not go inside. The same thing - you had to bring tickets you'd purchased in advance a day or two prior online. Around the church peddlers were swarming and I felt like someone was going to pickpocket me any second. We felt really upset that these major tourist attractions were not better organized. I expected Barcelona to be more like Paris but with all the selling and pressure from peddlers, it really was more like Tijuana. When it comes to the peddlers, let me note that I am compassionate to a point. Yet, I felt like Barcelona has lost all control. These people are mostly peddling to survive but it creates a terribly stressful atmosphere if you are there to relax on holiday and you are constantly being targeted. I know how much Barcelona relies on its tourism economically, so I believe tourists need to be heard on these issues. I've been all over, from Casablanca to Istanbul, Milan to Stockholm, and of course Mexico, Canada and to nearly all of the 50 Unites States. I'm not a diva who expects perfection at all. But the city needs to regain control. The peddlers at the tourist points, in the park, on the beach, at the Gaudi buildings... they were mosquito's - it was the equivalent to going to the souks in Marrakesh and having aggressive sellers begging you to buy from them. You expect this in the souks, not at a public beach. The next point is that there is a real sewer problem in Barcelona - we barely ate outside unless it was on a rooftop because you could smell the sewers. Also, lots of public urination so when it's hot and humid... Some parts of the city were overwhelming. Other than those few annoyances, Barcelona had lots of positives. But I suggest going off season if you want a more relaxed environment that's a bit more authentically Spanish. I imagine the city is different in October versus in the middle of July when we were there. The food in this city is delicious - not so much the sweet stuff but the salty. We ate at some lovely places. I had the best Sangria ever. I enjoyed delicious tapas. I took a lot of photos of beautiful, historic buildings. I climbed to the top of the Gaudi Park (stunning views from up there) and made silly videos on my phone. I walked over 50km in 3.5 days, so I came home feeling really fit. Out of everything about Barcelona, what I loved most was the weather, the tapas and the Sangria. The weather was super hot with a nice breeze and plenty of rooftop spots to run to for cool breezes and yummy drinks (but only if you know of them, they aren't obvious), ask around. I really love the rooftop culture here and vowed that someday I need to have a rooftop terrace with lots of plants and parties! I must wrap up by adding that I loved the Picasso museum (), his early works were stunning. exhibited extraordinary artistic talent right from the beginning, it was shocking really to see this and highly inspirational. My favorite had to be seeing his interpretation of Las Meninas, composed of nearly 60 paintings of the single painting by Diego Velázquez. It's the only complete series of Picasso that remains together in the world, so it was amazing to behold. I enjoyed seeing his blue period work as well since it was so somber and such a stark contrast to his rose period. I also liked seeing some of his early works on corrugated cardboard, it was magnificent to see how he could paint on anything and still amaze. Don't get me started about his ceramics. Yeah, he did some fantastic ceramics as well. I had no idea. What inspired me the most about Picasso, and what I couldn't stop thinking about during my entire visit, was how he didn't have one particular style. In fact, you may not even had recognized his work from one period to the next had it not been signed and documented, there was no red thread. His blue period looked nothing like the early landscapes he painted or the portraits of his friends, nor did it look like the later work that most of us know the best. I have the feeling that designers and artists are consistently told how important consistency is in their work in order for it to be somehow esteemed, valued even. You need to have a certain "look" to your "brand". I realize that this is, in most part, very true if you want to make money. But when I looked at Picasso's work, I realized how deceived I've been ever since studying marketing in college. What do I mean? Modern day marketing and economy have changed the way creatives think about their work and how young creatives look at their body of work. It's a bit unfortunate. I rather like the idea of reinventing ourselves throughout the years, making what we want to make, being happy with the results regardless of whether it is selling well or not. I guess the best way to do it and make a living as an artist or designer in modern times is that you have your mainstream stuff to show the world, and late at night in your room you are doing the good stuff that sets your soul on fire that you know wouldn't sell. You make art for the sake of making art. So that's my review of Barcelona. If you want some suggestions on where to eat, where to drink, etc. try the links below because they are very good. The first link is fantastic because I missed every spot in the guide and wish I'd seen this link before my trip. We stayed at y in a room with a private terrace that had lounge chairs and a shower. It's loud on the weekends, so bring earplugs. We did a lot of lounging in with free wifi. It's located in the same building as Casa Bonay. - The best cappuccino I've ever had in my life (sorry Italy). Also the best glazed donuts. Also located in the Casa Bonay complex. - At the top of Casa Bonay, there are two sides when you exit the elevator. To the left is for hotel guests only and where we basically lived when we needed to rest and refresh. To the right is Chiringuito, and is open to the public. Great spot.
. This looks like a gorgeous property to stay in, especially with their rooftop swimming pool, lounge area and bar. We stopped by the Claris to catch the views from the roof, relax on the lounge chairs, and enjoy some drinks. Great service and very welcoming. I didn't find the sweets in Barcelona the big attraction, but when we had a sweet tooth we went to and it was perfect. Authentic and family-owned right around the corner from the Picasso museum. Go to the , even if you can't stay there, go have breakfast, lunch or dinner. You won't be sorry. You can also eat outside but I loved the interior of the restaurant. Stunning. Totally Instagramable too. There are not many interior design shops in the city, but I stumbled on one that was quite charming called . I'm sure others exist, but they must be hidden because I roamed the streets and googled and Instagramed myself into a coma trying to find them but couldn't. But I don't think people go to Barcelona for interior design shopping. Lots of fashion and great stores for clothes though! I loved the leather handbags and shoes in the shop. Gorgeous. Highly recommend. My favorite food experience was eating at . I wish this was a franchise and all over Europe. I've never eaten so pure, so whole, so fresh, so beautifully before. I give this place 5 stars all the way. Go go go! Also highly Instagramable! (Spanish fashion label) has a nice outlet store (street address is Girona 38) with very affordable finds. I just loved their clothes! Someone highly suggested clothing store but I didn't get to go there, maybe you can. I loved the foodie shop but even better was the secret little tapas restaurant in the back where we ended up totally pigging out and getting really tipsy on the best Sangria I ever had in my life. And the people are SO NICE in this place. 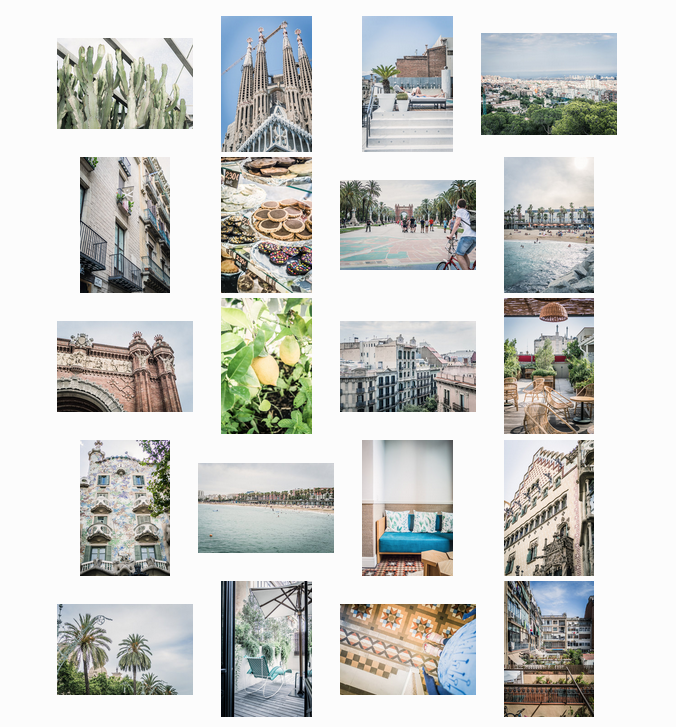 Neighborhoods to roam: El Born, Gothic Quarter, Barceloneta, Eixample, Gracia (more of a local flair). Have you been to Barcelona? What inspired you there? What did you learn? Do you have any suggestions on where to shop, eat or go? Any insider tips? I first found out about French interiors brand at the imm Cologne fair in January (remember, I had a booth at the fair!) and thought they had a really unique and quirky style. Their design is fun and definitely very inline with their style sensibility - and I like that, it's not exactly like everything out there yet it still manages to feel very current. I thought I'd give you a little introduction today to Harto by way of some beautiful photos that you may enjoy or want to pin to your Pinterest account. Here are a few of my favorite things from Harto that you may love, too. I love the shown above and the mirrors, in fact especially the . I have three of them that I will put in my bedroom as soon as I finish redecorating it. I'll show you how the room comes out in a post at a later date - most likely September when I'm back from Helsinki. In addition, I also am a fan of the Harto Leon because they strangely remind me of paint lids and I've always loved the insides of paint lids. I wouldn't mind having a set of these for my dresser to place my jewelry. Hello everyone - I hope you are doing great! You may have noticed something different when you visited the blog today - it's all new! We have a brand new cattledogs with lots of content living on the front page now that is not only very visually rich, but helps you to navigate the site better. I'll detail in a later post about why we changed platforms, the experience of moving 11 years worth of blog content over, and lots of other details that may interest you. But first, let's talk about this lovely little company I found in Scotland called . Bohemia was founded by Jenny Lockton over a decade ago after she'd spent years working globally with artisans. Combined with her excellent design eye and love for quality, Bohemia Design was launched in 2006 so she could collaborate fairly with these artists and designers while also serving her clients with only the best products for the interior, as well as some fashion accessories. About their small company based in Edinburgh, Jenny says, "We design unique collections of fashion and home accessories and work in ethical partnership with artisans in Morocco, India and Turkey to produce contemporary handcrafted goods with an authentic soul." I recently had a chance to obtain some products from Jenny's company for review under the agreement that if I loved them, I could review them on my Instagram (and keep them). If I didn't, no worries, I would return them and never share on my social sites. Well, I liked what came in the post so much that I decided to review on my blog and Instagram because if you love Boho Style, you need to know about this shop. First let me say that good quality is not so hard to find, but superior quality is. There are tons of shops selling Moroccan leather pouffes and slippers so I was hoping that Bohemia Design was a step high above the rest because the last thing we need is more of the same. Happy to say, when the in soft pink, the and the arrived, I was overjoyed. The pouffe (I ordered two for my living room) is my favorite - the leather smells so good and nothing like the smell of the ones I've sourced in the past where the leather was such poor quality that the smell of it was horrible. I ordered pouffes from Egypt once on eBay in 2007 and they made my house stink so bad for so many months (I was waiting for the smell to go away, it never did) that I had to throw them away. Another important point about the pouffe is the color. I opted for the soft pink which is the prettiest pale pinky peach ever. I've never seen a pink pouffe in this exact share. I'm very particular when it comes to pink. You must know what I mean. It's one of those colors that can go wrong in the home very easily (outside of kid's room decor). This pink is just gorgeous. Needless to add, but happy to say so again, I really love Bohemia Design and their products. Jenny was so nice to email and so friendly. Their is loaded with fashion and home accessories so you really should check them out. Maybe you'll want a pouffe like mine, too.